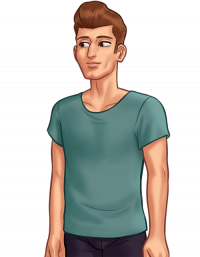 Kevin is a well‐built teen of tall stature with half combed brown hair and brown eyes. His typical attire of a teal T‐shirt and bright red shorts. When a favor is returned to him, Kevin is willing to return a favor back of his own. He is very active and he prides himself of being well‐built. When it comes to working out, Kevin is very supportive and motivational of the main character of getting ripped too. It is also heavily implied, if not outright stated (and written all over the bathroom stalls), that Kevin is gay. His homosexuality is also one of the more well‐known secrets of the school. Kevin is a student at the main character's high school. He is also working at the school's cafeteria. He agrees to spot the main character in the gym in exchange of his replacement in the cafeteria duty. After finding a replacement for Kevin, the player is able to work out with him in the gym to improve the strength stat.